This once-a- week-meme was originally begun by Kim of Frog Ponds Rock, as a way to showcase some of the many photos we all take, but don't get around to showing on our blogs. 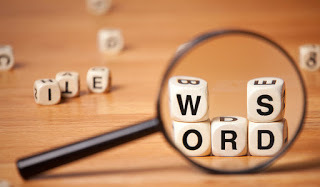 3. leave me a comment so that I know you've joined in and can come over and see what you've posted. 4. hop on over to TheElephant’s Child to see more of her wonderful photos. Kath and Andrew often join in. I usually go with a theme for my Sunday Selections and this week I'm continuing with some photos from my trip to the Gorge Wildlife Park with my friends J and J.
Dingos, the Australian wold dogs that live mostly in the interior, the red centre, what we in the cities call the outback. our Aussie equivalent of the wolves and coyotes in other countries. J is reaching in and scratching behind his ears. wallabies roamed freely and followed anyone who had packets of biscuits for them. they are a smaller cousin to the kangaroos, this one didn't hop over until J held out some biscuits. 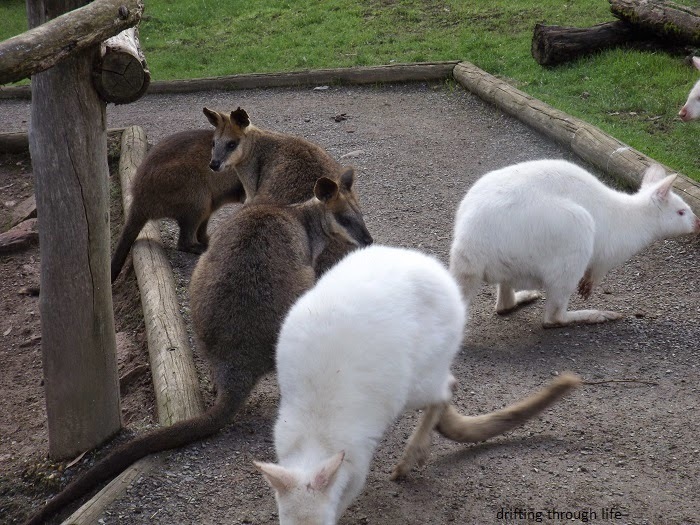 I'd heard there were albino wallabies, but was surprised to see so many. 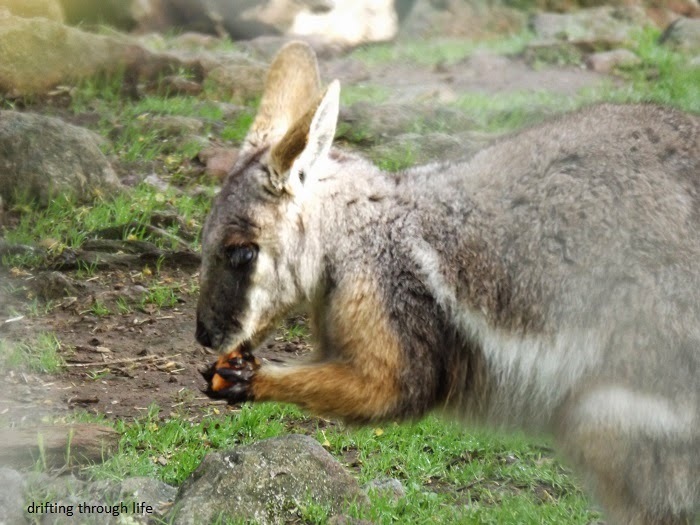 Roughly half of the wallaby population was white. they were very keen to get their share of the biscuits J was handing out. a mixed mob at the other end of the field. It was a very large field, fenced, with gates that people must close when entering or leaving. a rather large joey getting lunch from mum. It looks like a lovely day. I would love to give a dingo a scrootch behind the ears too. Are you feeling better yet? I do hope so. Dingos are causing a nuisance on Fraser Island....a pack attacked a chef from Happy Valley, an area on the eastern side of the island, earlier this week. He ended up in hospital; and his clothes were torn to shreds. He's lucky he's alive. Wallabies are cute and seem much nicer than kangaroos, which can be quite dangerous. 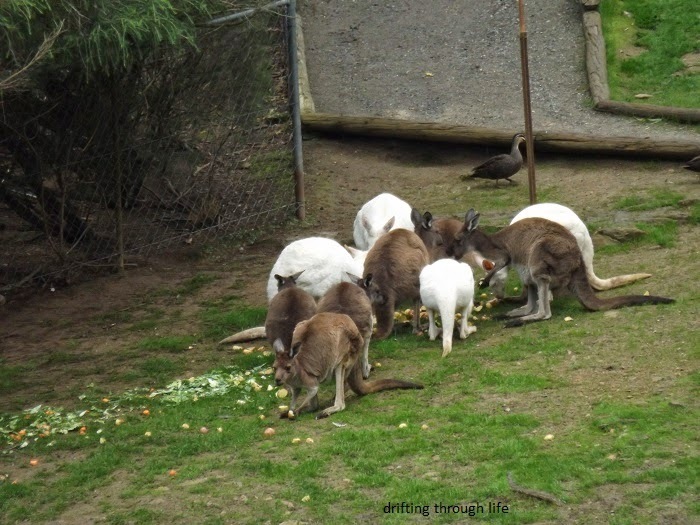 I know about albino wallabies but I wonder if there are albino kangaroos? Coyotes are easily distinguishable from dogs, but your dingos surprising resemble huskie dogs around their faces. We have such wonderful wildlife. Dingoes were originally crossed with herding dogs, and are the origins of Aussie Cattle Dogs/Blue & Red Heelers - like my Jack. I used to train with a woman who lived with two Dingoes, in W.A. And I could see the very strong resemblance to his lovely Dingo forebears in his conformation. I agree with Joanne, the DIngos look like they would make wonderful house pets. I'm guessing looks would be wrong. The dingoes look deceptively domesticated. Those dingoes are beautiful as are the wallabies and those albino ones look so different to the darker ones. I do hope you are feeling better every day and will soon be completely well again. I am joining in this week after following for a bit through Elephant's Child. Love your dingo pictures. I have red foxes who live around me. 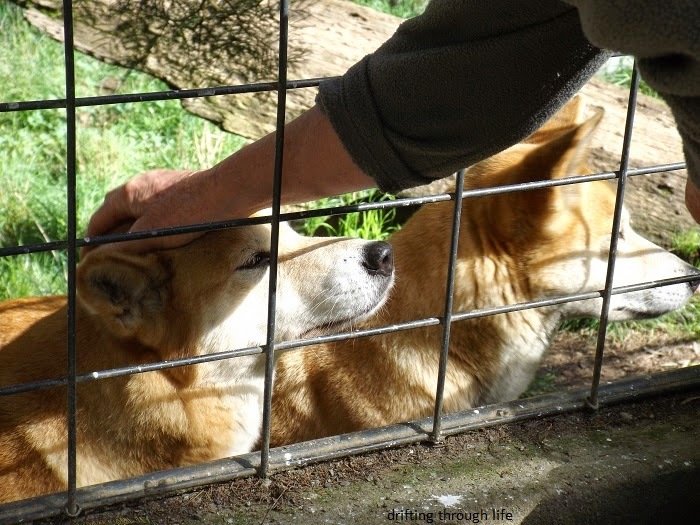 Wow, pretty amazing that you can reach into the cage and pat the dingoes! Not sure I would have been game to do that. 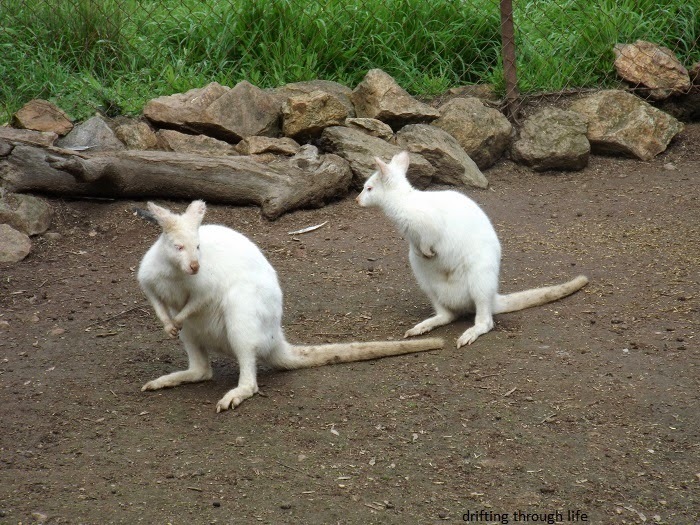 First time I've ever seen albino wallabies - they're very cute. Love the photo of the mixed mob. 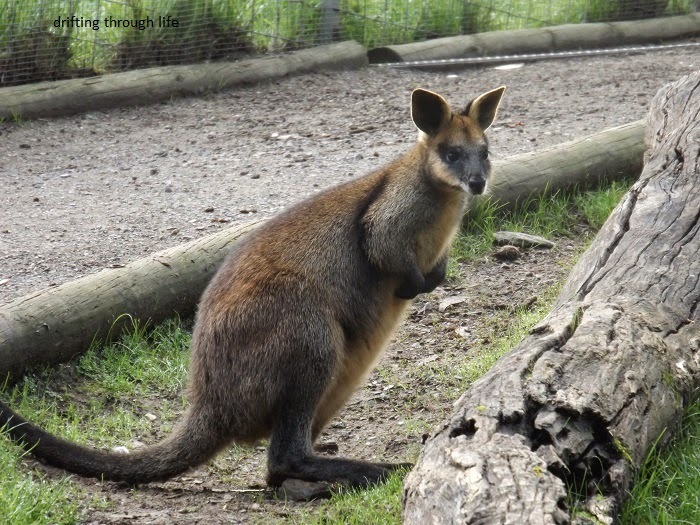 I agree with Andrew - wallabies nicer than kangaroos, which I have always found a bit intimidating at those parks where you can feed them - they're so broad chested and muscly they're a bit scary up close. I've seen documentaries on dingos by Jane Goodall but these look like any domestic dog on the street and very nice looking, I may add. 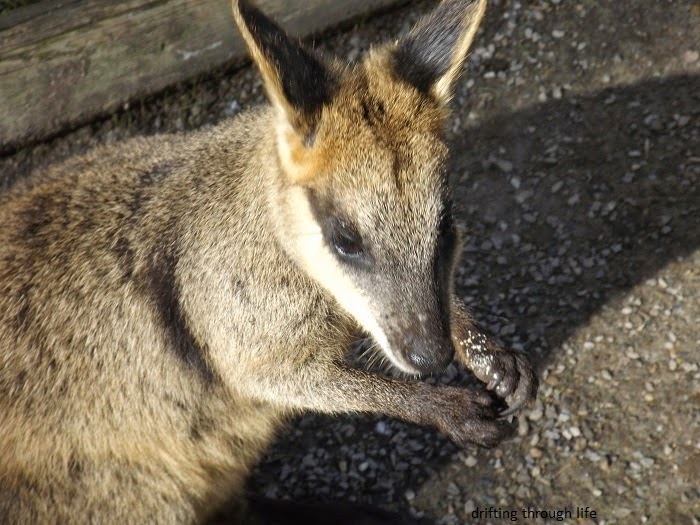 The wallabies are a cute, perky little animal. I don't think I've ever seen one for real. 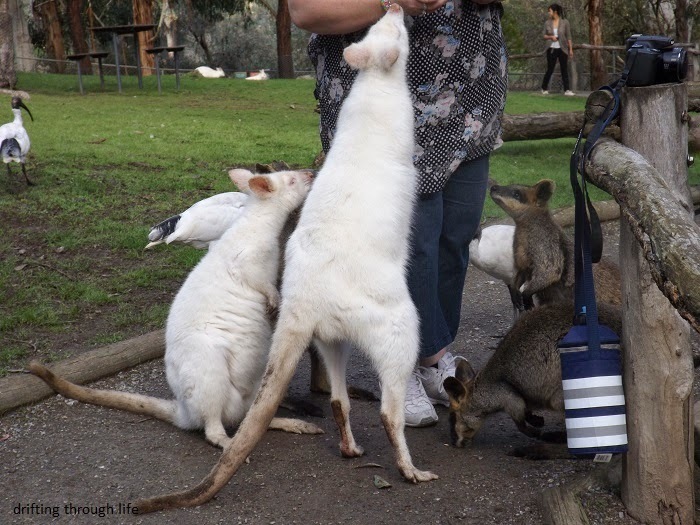 I always thought albino kanga/wallabies look like a giant rat. Only change my mind when I heard the christmas song 6 white boomers. Elephant's Child; I wasn't in any hurry to scratch the dingoes ears, there were more than enough people reaching in to do that already. Lee; perhaps a dingo stew could make an appearance on the menu..
100% will take a while. Andrew; I didn't think to check for albino kangaroos. Joanne; they do look a little like huskies. They're probably related about a million generations back. Vicki; I actually knew that about the dingoes and cattle dogs. sometimes I surprise myself. joeh; I don't agree with them being pets, even with careful handling and proper training, there is always going to be that wild side. Like the one that lived next door to us when my oldest was 18 months old. It jumped the fence one day and ate her kitten right in front of her as I raced down the stairs to shoo him away. Delores; looks can be deceiving. These three are very used to people, they have been at the park for some time. But that doesn't mean I would trust them. Mimsie; they are beautiful when properly cared for. I'm slowly getting better. Donna; welcome to drifting. Red foxes would be lovely to look at, we have foxes out here but I think they are grey. I've never seen one. 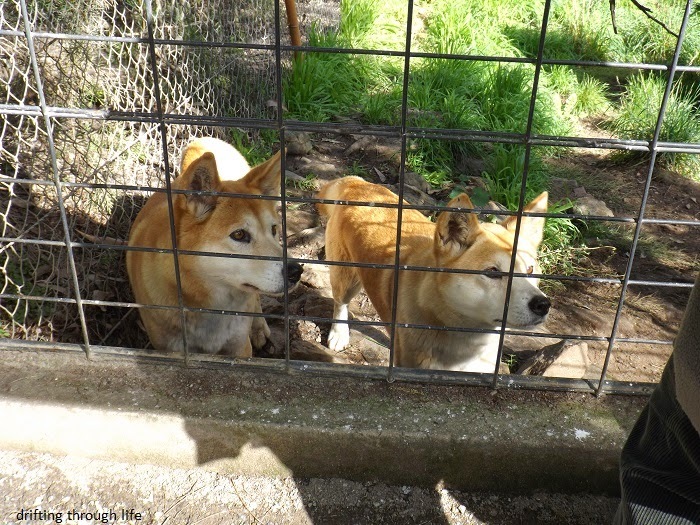 Jackie K; the dingoes are very used to people, when they've had enough of the attention they just run away from the fence area. I agree big muscly kangaroos can be a bit scary. Manzanita; these dingoes have been well cared for their whole lives I think, so they look in top condition. The wallabies are cute, but if you have food they will push and shove and follow you until you go back out the gate. Susan F; I'm glad you enjoyed the photos. I vaguely remember seeing your dog. mm; I haven't thought of 6 white boomers in a long time. My mum used to play it every Christmas. are we heading for another Ice Age?